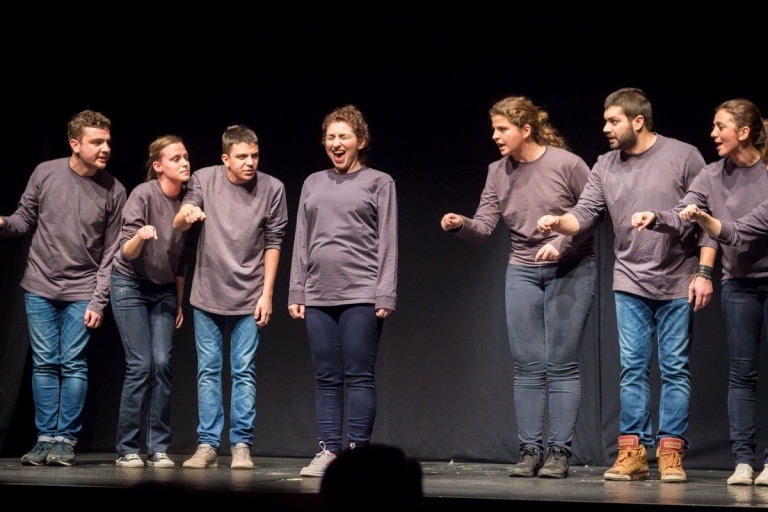 A Novi Pazar-based theater group throws a spotlight on social issues that go unchallenged, generating hype and stirring audiences across Serbia. But their recent performance has also courted political controversy in the group’s hometown, where it hasn’t been performed since its debut. Premiering on January 10, 2015, at Novi Pazar’s Cultural Center as part of the Youth Theatre Festival, Beton Mahala(“Concrete Neighborhood”) takes on social and political issues on both a regional and national level in Serbia, confronting problems such as national identity, political division, language politics, and interreligious relations. “[Beton Mahala] is a way of living. It is a way of thinking, a way of watching things around you and having a reaction about everything that goes around and comes around. Beton Mahala is courage for saying what you see without any other coloring…Beton Mahala is [a] direct opinion about everything that is around,” Rifat Rifatović, one of the show’s two directors, explained. Over the last year since the premier, the play has toured across Serbia in cities including Belgrade, Novi Sad, Užice, Požarevac, Kragujevac, and Sombor. The play has competed in festivals in Kolašin and Kotor in Montenegro, performed in the 2015 Belgrade International Theatre Festival, and won the Grand Prix at the 51st Amateur Drama Festival in Kočani, Macedonia in May 2015. Ajtana Dražanin, one of the show’s eight actors, explained that the show resonates everywhere it is performed and hopes that it continues in the future. “It’s really funny, but we never thought the play would have such a huge impact in the way that it has. We definitely want to continue because I do believe that it is something that is really current, something that is really important for as many people as possible to see…For me, it’s basically a resistance to accepted conventionalities that are current here and just adapting a different view, just accepting both sides, accepting difference, and living together in a tolerant community. I think that’s why it’s really important for it to continue,” she said.The play, which was directed by Rifatović and Branislav Trifunović, was written collaboratively by the eight young Novi Pazar-native actors who make up the group, including Dražanin, Petar Kostić, Džana Ljajić, Ema Muratović, Draga Kostić, Lejla Bučan, Amar Ćorović, and Nedim Nezirović. Although some of the show’s actors had performed together before, Beton Mahala was the first show that the eight current cast members and the two directors collaborated on. In late 2014, in preparation for Novi Pazar’s Youth Theatre Festival, the actors auditioned, were selected, and began discussing what they would perform. Trifunović explained that the crew initially began rehearsing a scripted Serbian play, but after engaging in discussions with the actors about problems they were facing in Novi Pazar, the directors decided to go in another direction. “After three or four days, we [saw] that their stories, the stories of [those] kids, [are] much stronger than anything else,” Trifunović said. Kostić, another of the show’s actors, added that Trifunović, who is not from Novi Pazar, asked the crew why they were not talking about these issues. “We [told] him, we are not quiet, we are just not asked about anything. We just have to do some things, and it’s by the system…And he was angry about it and wanted to change it,” he said. Dražanin explained that the crew therefore decided to create their own play based on their personal experiences living in Novi Pazar, a historically multicultural city. “We talked about some major issues in Novi Pazar – everyday social issues that we meet with – and we decided we have some true life events that happen every day that we thought would be more appealing or more important to tell about,” she said. The cast worked through improvisations and discussions to develop scenes that would highlight the different social issues they selected, with Kruševac-native Branislav Nedić working as playwright to record the actors’ words and write a script.“It was our words, it was not some script [that] somebody wrote and gave to us to play. It’s our text. And it was great because every word, which is in the show, is our word. None of it was changed, none of it. It’s not great, it’s brilliant, I think,” Kostić said. Kostić added that in his favorite scene, a young couple that comes from two religions is forbidden from seeing one another by their families. “All my friends said, yes, that’s not only your problem, that’s our problems. Because they do not have completely the same situation, but parts of that they had. There are no people in this town…who don’t have that problem. Love is not what you want, it’s something that you get, and it’s stupid when somebody says to you, you can’t love somebody,” he said. Dražanin explained her favorite scene is one of the final parts of the show, in which some of the characters are leaving Novi Pazar while others are staying behind. “It’s basically that necessity to leave this town. That is something that is really moving and disturbing, but it’s something that has happened really frequently in the last couple of years…In the end, we get separated, so I guess [it’s about] the issue of not having enough opportunities and [the] ability to prosper because of the political situation, not only in Novi Pazar but in the entire country,” she said. The show’s debut in Novi Pazar was sold out on its first night and returned for a second show the following night. “We really weren’t expecting anything. It was something completely different for Novi Pazar and for us generally, and I don’t think we understood the importance of the play. We knew it was going to stand out, it was going to say something, and it really had a huge message, but we really didn’t think it was going to be so well-received,” Dražanin said. However, the performance stirred controversy at the local level among political elites and has since not been welcomed back to Novi Pazar. Deputy Prime Minister and President of the Social Democratic Party of Serbia Rasim Ljajić attended the show’s premier in Novi Pazar, but reportedly left before the end of the show. According to Serbian tabloid Blic, Ljajić claimed he had other affairs to attend to, but acknowledged that he did not like the performance because he believes it shows Novi Pazar in a negative light. Since the show’s first two performances, it has not been played again in Novi Pazar.“I think that they don’t want that show over [in Novi Pazar] because it’s all about politics there. Those kids talk pretty much truth, and politicians don’t like the truth in their own city because they cannot control that. So I don’t think it’s possible to play in Novi Pazar again,” Trifunović said. Rifatović added that the show is not meant to insult anyone, but rather to simply speak the truth. “We are not saying the truth just to hurt someone. We are telling the truth about ourselves because we are telling our stories. [Beton Mahala] is our stories, and it is not the stories about the people somewhere [else] in Novi Pazar. It’s stories about us in Novi Pazar. The phrases we are using in the script, they come from our hearts,” he said. Since the premier, the show has been performed over 25 times, both across Serbia and in neighboring countries, and is scheduled to premier in Bosnia and Herzegovina in April. Dražanin added that the show has been well received in each location they performed, no matter how different the audiences have been. “It’s really interesting, but the reception everywhere is really the same. People react to the same things, people smile, laugh, or cry to the same things. It’s really amazing how everywhere the message is received in the same way…Everywhere we go, people are really just amazed and really moved by us, which I think that’s one of the most important segments of this play,” she said. Trifunović explained that plays such as Beton Mahala that directly confront social issues are still not very common in the Serbian theater scene. “Theaters in Serbia are not speaking that loudly about [social] problems. Theaters in Serbia are blind to those problems…It’s all about politics so far, so the people are mainly scared to talk about the problems. So they’re all waiting [for that time] to pass by and just waiting [for] some better times. But I don’t think it’s a good time to be quiet or be silent,” he said. Dražanin said that she believes that even if only one person in the audience sees the show and is moved by it, they have accomplished something. Kostić added that the story of the play can be understood everywhere. “I know now we will go far, and I’m happy about it. You simply know it’s not only [in the] Balkans, it’s in Germany, or in U.S.A., people with [the] same problems. Wherever you go, you can find some people who have their Beton Mahala…People can identify, maybe not in every scene, but minimum in two scenes, they can find themselves,” he said.